One of my favorite spots in Tulsa is the Philbrook Museum of Art. It is not only a great museum it has wonderful gardens. 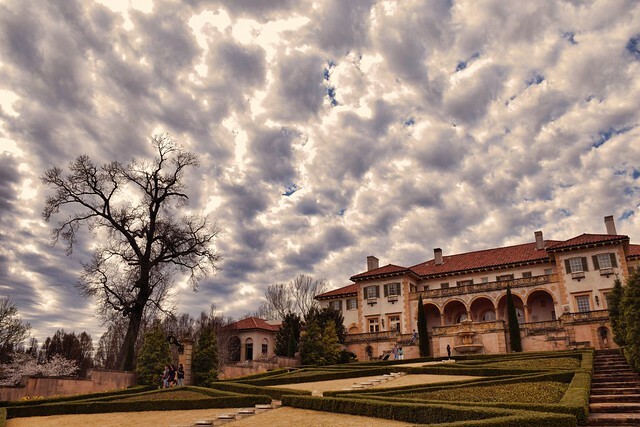 So last week I was out there taking pictures of daffodils and I took this tilted photo of Villa Philbrook and a twisted gnarly tree and a big dramatic sky. 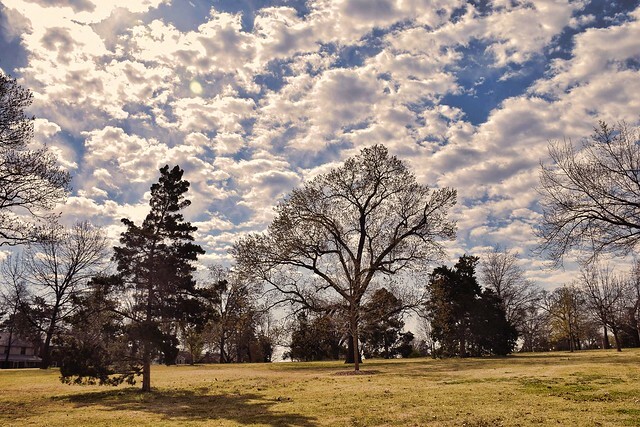 This entry was posted in Skywatch and tagged Oklahoma, Philbrook Museum, Philbrook Museum of Art, Skies, Skywatch Friday, Tulsa on March 24, 2016 by Alan Bates. 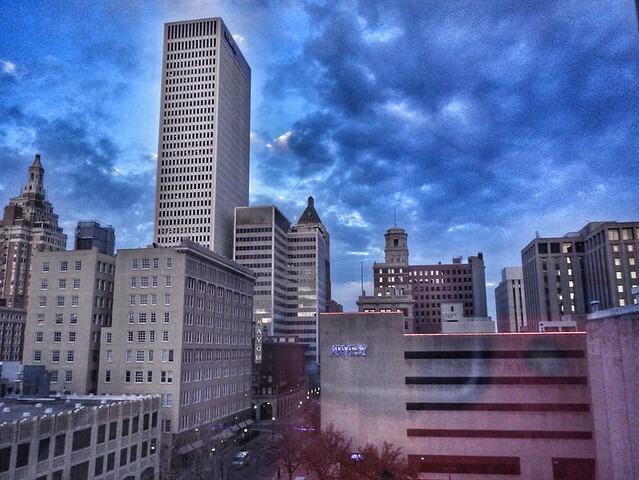 This is a view of downtown Tulsa. My favorite part of it is the reflection of my Nikon Coolpix AW110 against the building to the right. Used to be I’d worry about it and now, I’m like hey that is the way it is. There is lots of other things wrong with this picture but what is right about it is the tall building against the funky sky and the reflections of the western sun in the windows. What about you, do you have notions that the skeptics don’t like? 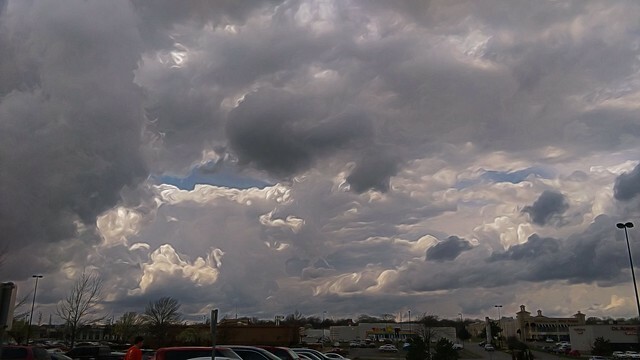 This entry was posted in Skywatch and tagged Oklahoma, Skywatch Friday, Tulsa, Tulsa History on February 24, 2016 by Alan Bates. I used Topaz Impressions software on this to give it kind of an impressionistic effect and then dialed it back about 40%. I also cropped out some annoying features. We are having some colorful skies lately here in Tulsa. I liked how the color was shining through the windows of the old downtown YMCA. A developer demo’d the interior and has the project on hold pending higher oil prices probably. I also like the reflections on the building on the left, the old Amerada Hess Petroleum building. They bugged out for Houston back in the 90’s during another oil downturn, and insurance company occupies the structure now. Will the last person in Tulsa please turn out the lights? 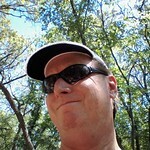 I’ve been told by numerous people that the energy companies manipulate the prices of oil, natural gas, and gasoline. That may be, if so they are doing a really poor job of it. What do you think. In the meantime I’ll be enjoying the sunsets. 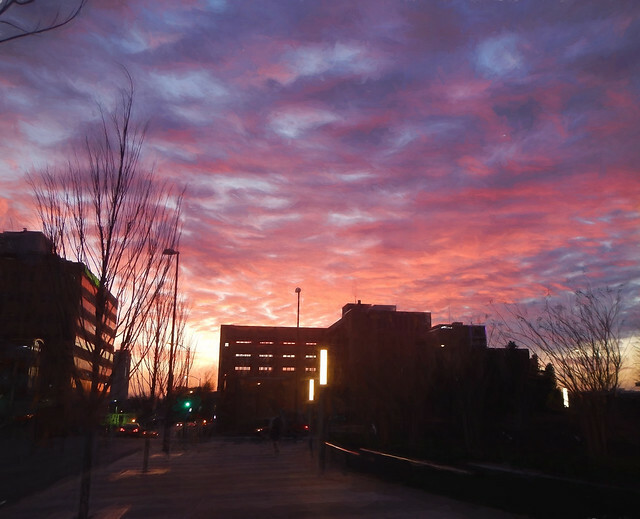 This entry was posted in Skywatch and tagged Digital Art, Downtown Tulsa, Energy Industry, Oklahoma, Skywatch Friday, Tulsa on February 17, 2016 by Alan Bates. I know that I’m being a little repetitive and I apologize in advance. 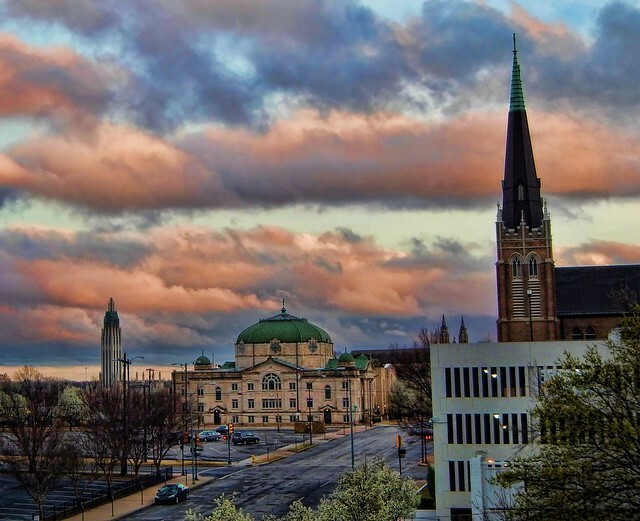 At about 5:30 these days at work I peak outside and if it looks like their might be a good sunset then I take the elevator up to my old floor where there is a clear view out to the west and go to my old office and take a few pics. One day somebody is going to be in my old office and I’m just going to have to tell them to get out of the way I have to take a photograph. It is getting warmer here in Oklahoma. On my run after work I was able to wear shorts and a long sleeved tee shirt instead of the running pants and layers of cold weather technical gear. In the depths of winter I’m warm but my goodness it is a laundry load. It will get cold again for sure but the trend is my friend as they say. I’m looking forward to the beginning of daylight savings time so I can back to run on Turkey Mountain on Wednesday nights. So are you looking forward to the change of seasons? 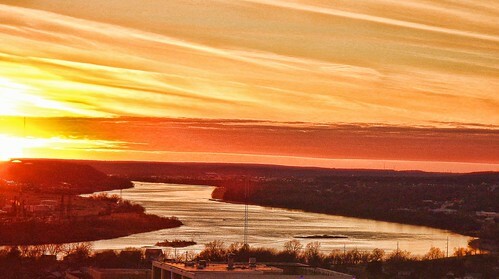 This entry was posted in Skywatch and tagged Arkansas River, Skywatch Friday, Sunset, Tulsa on February 11, 2016 by Alan Bates. 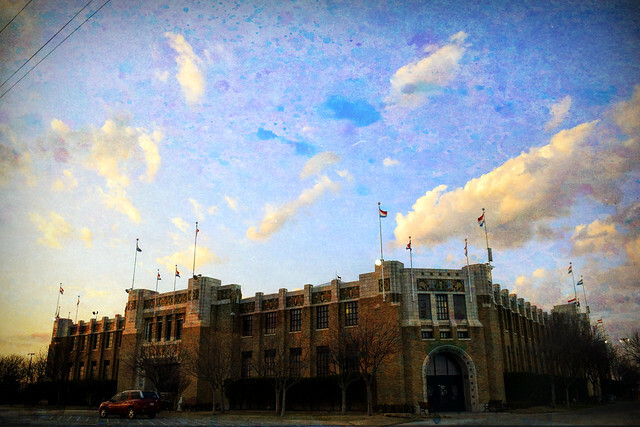 Last weekend’s weather in Tulsa was downright Springlike. Warm, dry and sunny. Heather and I went hiking in shirtsleeves, meanwhile our son was on his school trip in Breckenridge negotiating lots of snow. So how is the weather where you are? 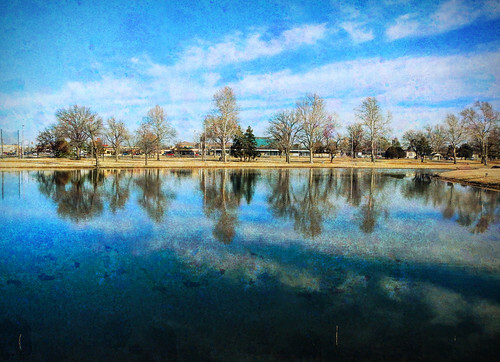 This entry was posted in Skywatch and tagged Digital Art, Lafortune Park, Oklahoma, Skywatch Friday, Tulsa on February 4, 2016 by Alan Bates. I saw the orange glow in the western sky so I grabbed my little Nikon AW110 point and shoot and took the elevator up to my old floor in my office building and went over to my old cubicle and took a few shots of the western sky with the Arkansas River. I never get tired of this view. 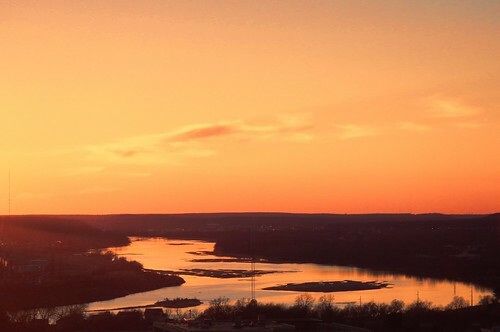 This entry was posted in Skywatch and tagged Arkansas River, Oklahoma, Skywatch Friday, Sunset, Tulsa on January 28, 2016 by Alan Bates.